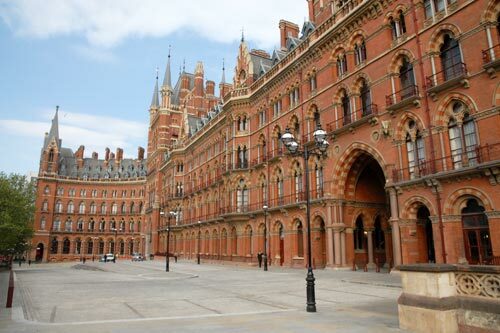 With the renovation of the hotel at London St Pancras station completed, rail journeys to Europe could not have a better place to start than this wonderful Victorian construction masterpiece. The addition of the Olympic 'rings' suspended from the vast overall roof, everything is in place to make this the great London rail terminal that the city deserves for the Olympics in 2012 and beyond. Photo - The newly opened forecourt makes the frontage of St Pancras look even grander. Despite the grandeur of the station, rail journeys to the Continent do suffer from an overdose of tunnels and anyone hoping to enjoy wonderful vistas of London will soon be disappointed as the train burrows underground to exit the city. Where the rails are above ground, the view is less than exciting with the scruffy Essex landscape of distribution sheds and container terminals providing a rather depressing view of England. Another tunnel under the Thames brings you to Ebbsfleet international where a brief stop allows more people to board. Under way again, glimpses of the Kent countryside and the River Medway go some way to redress the balance of views through the window. However all too soon the train disappears underground for twenty minutes or so as it crosses under sea to France. As you emerge into daylight in France the last tunnel has been negotiated on this journey and you can start to enjoy an uninterrupted view. Despite similar geology on either side of the English Channel, it is very apparent that England and France are different. The hedgerows around the fields have gone, the village houses are of different design and character and the roads are empty - this is definitely France and not the Garden of England. Speeding through northern France you soon become accustomed to the speed and 186 miles or 350 kilometres per hour seems pedestrian. Another Stop at Lille Europe station, the interchange for the French high-speed rail network, with TGVs heading as far south as the Mediterranean. On the move once more crossing motorways choked with traffic the train veers left abandoning the line south to Paris to join the route to Brussels. Somewhere here you cross the border into Belgium but such are European politics that there are no posts, or signs so that the actual crossing place remains a mystery to most passengers. This part of Belgium looks not much different to France and the use of the French language helps to camouflage the cultural differences. Passengers have probably realised that on train announcements have featured French and English with some wondering what the third language really was. Belgium is a two language country 40% speaking French and the remainder using Belgian Dutch as their means of communication. The train continues its high-speed dash north to Brussels soon slowing as it joins conventional tracks for the final stage of the journey to the Belgian capital city. Once Dutch speaking, the city is now predominantly French speaking although evidence of Dutch and French are everywhere including the station name which is alternatively "Gare du Midi" or "Sud". Exit from the station is fast with no dramatic architecture greeting you on arrival. All you have to see is a shopping mall style station where most of the brands are similar to London - such is the style of international travel in 2011.